Obituary for Vitalene "Vicki" Wilson | Grays Funeral Chapel LTD. It is with great sadness that the family announces the passing of Vitalene “Vicki” Wilson (nee Wasacase). She passed peacefully on August 14th, 2018 in her 85th year. 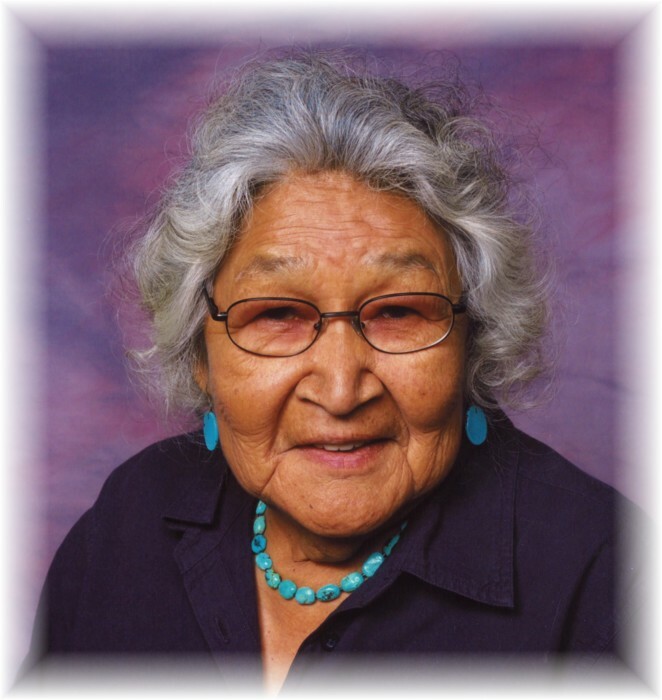 Vicki was born at White Bear First Nation on August 21, 1933, to Bella McArthur (nee Joyea) and Rueben Wasacase, and stepdaughter to Gordon McArthur. Vicki worked tirelessly as an educator in culture, language, and ceremonies. She was a traditional knowledge keeper and elder and spent most of her life fighting for the rights of the less advantaged women, children, the incarcerated, and the destitute. She was caring, loving, and compassionate. Vicki traveled the world for the benefit of indigenous people, while always seeking inspiration and insight. She was a residential school survivor who spoke little of her experience. Vicki was traditionally adopted into the Wahpeton Dakota Nation and spent many years forging lifelong friends/family through ceremonies. She loved all the lodges and participated to the end. She will be greatly missed by her husband and friend William “Bill” Wilson, daughters Leslie, Wanda, Tracy, and Nina, adopted son Leo Nicotine, brothers Macneil and Colin McArthur, sister Sally McArthur, numerous grandchildren and great-grandchildren, nieces, nephews, cousins, in-laws, and many adopted families, friends. Vicki was predeceased by her brothers, Wallace and Russel McArthur. Wake will be held at 4:00 p.m. on Friday, August 17, 2018, at the Wahpeton Dakota Nation School, Funeral Service will be held at 11:00 a.m. Wahpeton Dakota Nation School Saturday, August 18, 2018. Condolences may be sent to the family at www.grays.ca. Funeral arrangements have been entrusted to Gray's Funeral Chapel, (306-922-4729).